Operation Warm Wishes Presents: Give Big! Give Totally Super Awesome! 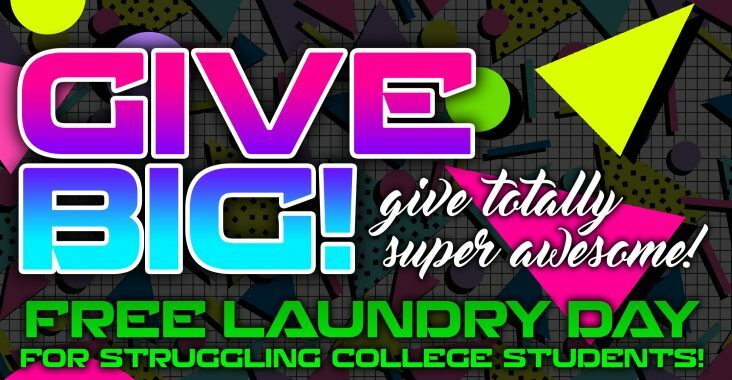 FREE Laundry Day for Struggling Students ( Elementary, Middle School, High School and College). Finals! Grades! Food! Work! Money! Bills, Time! Homesickness! Relationships! Ahhhhhhhhhhhhh! Laundry!!!! Student Life!! Don’t worry! It’s going to be a totally super awesome day of serving and making a difference! That’s right!!!! We are doing your laundry for free! Just bring your dirty laundry! All are invited! No one will be turned away!